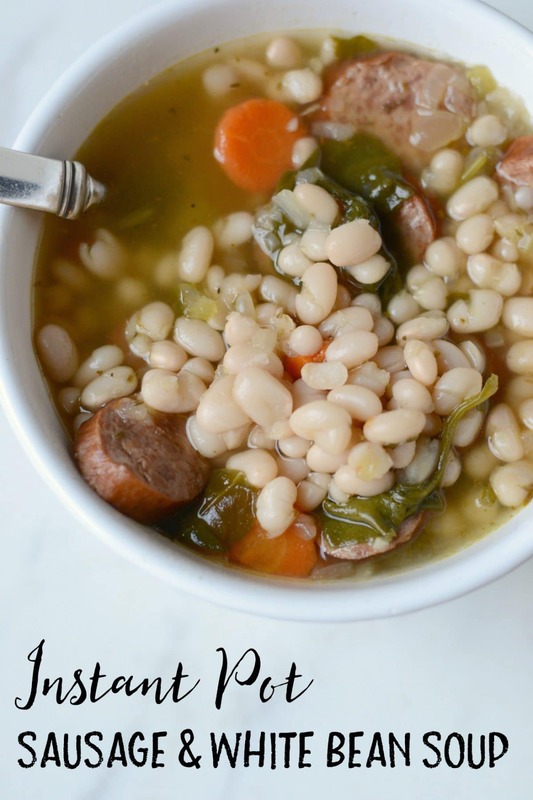 This Instant Pot soup recipe made with sausage, white beans, and vegetables is a family favorite. It used to take hours on the stovetop, but in the Instant Pot pressure cooker, it’s done in less than one hour. 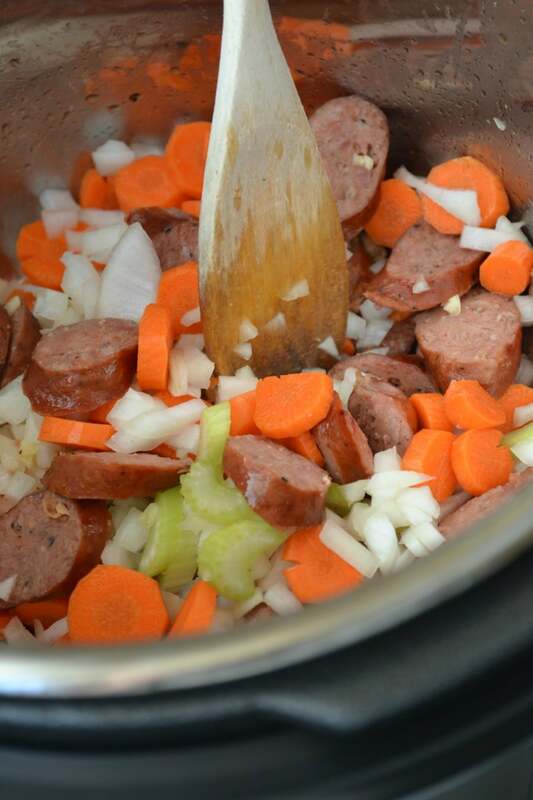 With the smokiness of the sausage and the addition of fresh thyme and rosemary, it’s got great flavor and tastes really hearty despite being packed full of vegetables. It’s my favorite way to serve lots of veggies at once, and my kids’ favorite way to eat them! 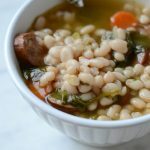 When I got my Instant Pot last month, this sausage and white bean soup was the first recipe that I wanted to test out. Although I’ve enjoyed making this soup recipe in the past, it’s been one of the more labor intensive recipes in my rotation, and I loved the idea of making it quicker and simpler in the IP. In the past, I had to soak the navy beans overnight and cook them for hours before they were soft. Even if I substituted canned beans, it still took at least 1-2 hours until they were soft enough to mash in order to create a creamier texture in the soup. When I made it in the Instant Pot, I was able to skip several cooking steps AND the overall cooking time was way shorter. After giving the turkey sausage, onion, and garlic a brief saute in the Instant Pot, you just add the other ingredients, set it and walk away! In about 30-40 minutes you’ll have a hot, lovely pot of soup just waiting to be eaten. As I explained in my Instant Pot 101 post, the cooking time can be a little misleading. 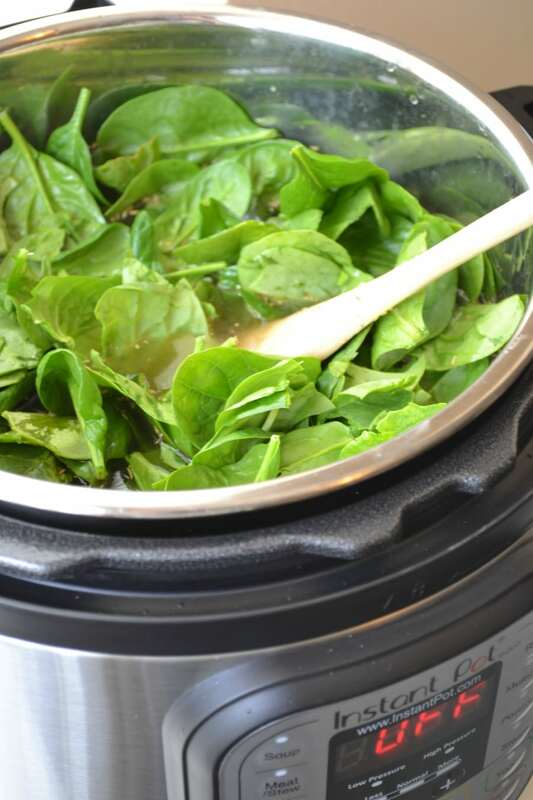 If you’re setting it to cook for 20 minutes, it could take up to 20 minutes for the Instant Pot to pressurize, which means a total cooking time of 40 minutes. Keep that in mind if you’re planning a meal for a certain time. You can substitute regular smoked sausage for the turkey smoked sausage if you prefer, but I like using the turkey sausage because it makes the soup less greasy, and there’s no fat draining involved. Set to pressure cook (manual) on high for 20 minutes. When finished, quick release the steam valve. Open and season with additional salt and/or pepper to taste. To thicken the soup, use a wooden spoon to smash some of the beans against the side of the pot. For best results, I recommend soaking the beans in water for 2-3 hours before cooking, or all day if you'd like to soak them in the morning before work and then cook the soup at night. I've made this successfully without soaking the beans at all, and set the IP for 25 minutes instead of 20, but some have mentioned that their beans aren't fully cooked this way, so I'm guessing the brand/variety of bean may be a factor. When in doubt, just soak the beans for a few hours prior to cooking. For meal planning purposes, keep in mind that it takes about 20 minutes for the IP to come to pressure before it starts the 20 minutes of cook time. I made this tonight with personal tweeks and we loved it. Thank you! *I soaked the beans in a brine of 2 quarts of water and 1 1/2 tablespoon pink sea salt for 4 hours in my IP Smart pot set at 120. Rinsed well to get the salt off. *I browned the sausage medallians in 2 batches, on one side only until caramel looking. (not with the onions) One side is all that’s needed for flavor. *Deglazed the pot after sausage links browned with 2 medium chopped onions and a good pinch of salt. The fond released into the onions and then I browned them for about 5 minutes on saute’ high. This step added a LOT of flavor to the soup. More onion, more Umami. *4 times more garlic (or more) added to onion at the end for a couple of minutes. * I set the IP on soup mode for 5 minutes only because I did not want the sausage and veggies to turn to complete mush nor all the flavor to be cooked out of sausage, and from experience know that well soaked brined beans will cook in 5 minutes. I let it sit for about 10 minutes natural release before releasing the pressure. Beans and veggies were perfectly cooked. Added spinach that wilted with residual heat. It is delicious and will make again. Served with Parm cheese and garlic/olive oil bruschetta! 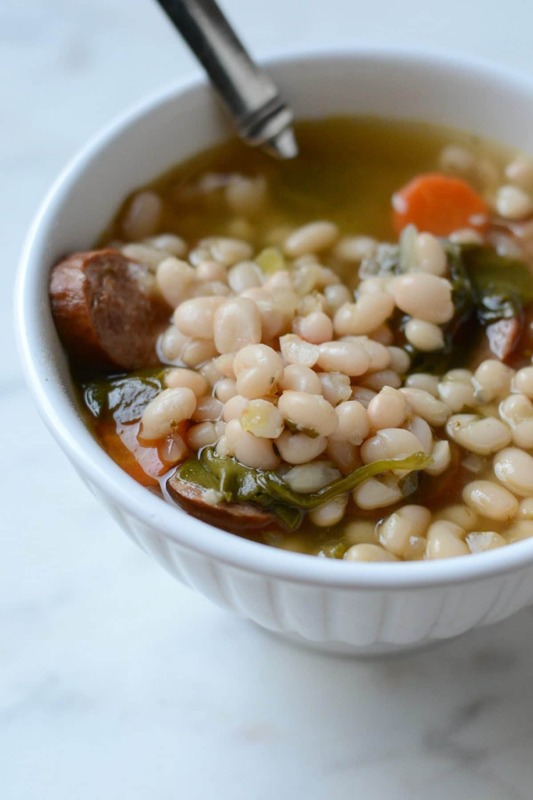 can you use cannelloni beans in this soup?